In 2016, Seraxis contracted with a leading global regulatory consulting firm to support the preparation of an IND application and communication with regulatory agencies. On-going work has identified the remaining testing that needs to be completed for the submission. The regulatory strategy of Seraxis includes the filing of an IND with the FDA and with an agency in Asia. This dual filing strategy is facilitated by Seraxis corporate presence in Singapore, and Korean partnership, and will allow SR-01 to enter the clinic simultaneously in two jurisdictions, with the goal of reaching patients faster. Seraxis started engaging with leading pharmaceutical companies to build early partnerships that will benefit the company throughout clinical development and early commercial preparations. In 2016, Seraxis signed a collaborative agreement with a pharmaceutical partner with world class GMP/ cGMP compliant manufacturing plants and infrastructure in South Korea. The objective of the collaboration is to develop and optimize a reproducible process for clinical scale manufacturing of SR-01. Seraxis will engage in Health Economics and Outcome Research (HEOR) early in the clinical development process to facilitate market access of its cell replacement therapy. 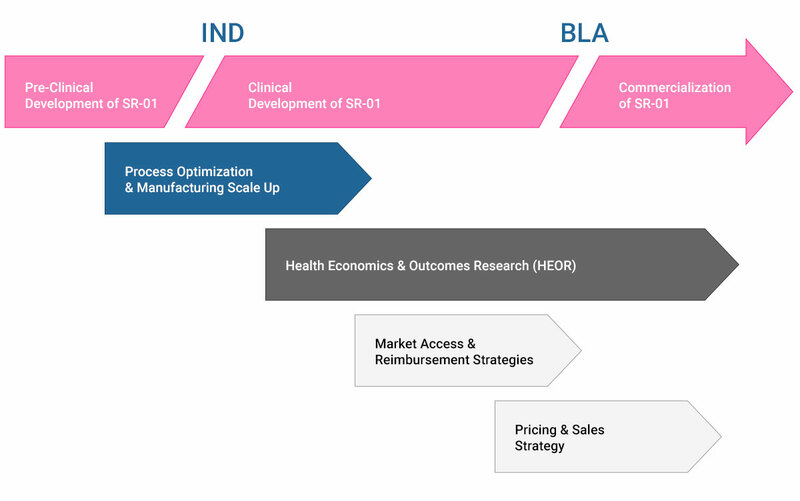 HEOR results will also support clinical research planning, the licensing and collaboration strategy of Seraxis, but also the pricing strategy of SR-01. Seraxis will initiate discussions with private and public payers early on to map the optimal entry strategy of SR-01 to the market.